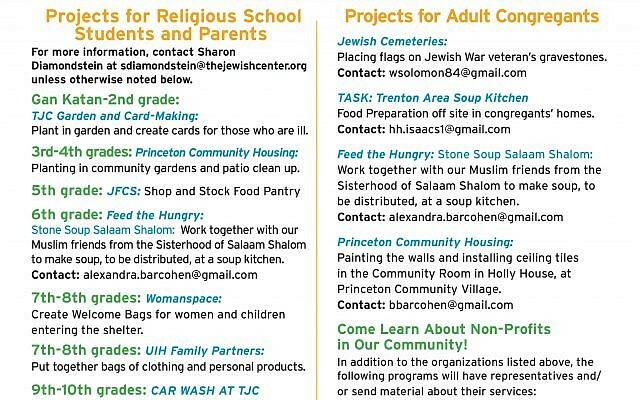 Sponsored by Retired & Senior Volunteer Program (RSVP) of Union County and hosted by Jewish Family Service of Central NJ, Elizabeth, 10 a.m.-12:30 p.m. Activities include assembling food packages for homebound seniors and low-income families, preparing a community vegetable garden, and meeting with elected officials; a light kosher lunch will be served. Dunkin’ Donuts gift card. RSVP to ALevine@jfscentralnj.org or 908-352-8375.